Early rise this morning. I made an appointment at the hair salon in Seoul for Rebecca and myself. I was in desperate need of a trim and highlights…I know, complete shocker these sun kissed blonde highlights are chemically engineered. I was really eager to introduce the sweet girl that cuts my hair. I knew Rebecca would really enjoy her. Rebecca got a pedicure and picked out the cutest color pink to boot. We took the subway down to the appointment. 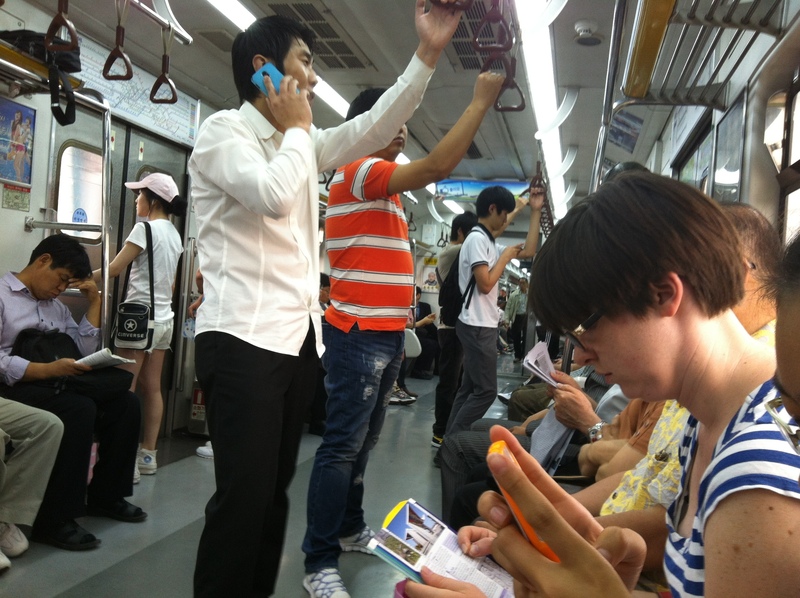 I knew it would be fun for Rebecca to experience public transportation in South Korea. Super convenient and super easy to use. Basically all your main areas are located along the subway line. Rebecca commented and said she couldn’t get over how clean the train and subway was compared to the DC metro. It really is rather clean and well kept after. After the hustle to get to our hair appointment, we we’re able to enjoy not being against the clock. Take our time. Stroll. Ha-ha! Well as much strolling that my long legs will allow, they are rather long. 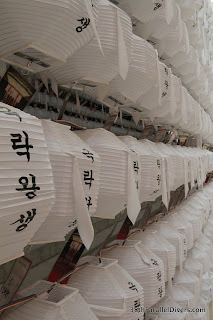 We walked around the Insadong area. Rebecca picked up some ceramic duck chopstick holders for a gift. We also poked in and peaked around some of the little shops. Rebecca got to try out egg bread too! I knew I want to let Rebecca try a Korean summer treat. Pat bing su. Rebecca tried egg bread and some other little vendor finds. Eventually after I drug her all over Insadong, we found a quaint second floor tea room serving pat bing su. Rebecca loved it! We both loved getting to sit down, chat, and catch our second wind. God bless her heart! I’m so thankful to have such an amazing bestfriend! After out Pat bing su we walked around a bit more and decided to continue on to our next destination. 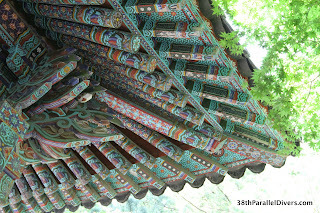 The Next stop was the Gyeongbokgung Palace. We stopped off at a Dunkin Donuts to grab a drink and of course see the crazy koreanized donuts. Take for instance the glutinous rice stick. I know doesn’t sound very appetizing, folks you don’t know what you are missing out on. At the Palace we took an English guided tour. Again, it never gets old to me. I learn something new each time I revisit a place. We had a great time wondering all over the palace grounds. We snapped some photos. It’s just incredible how the mountains and trees surround the back of the palace backdrop and the front is tall skyscrapers and the hustle of Seoul city life. It’s truly a place were you can see the old meeting the brand new. After wondering through the Palace grounds we decided to head towards the subway and mosey home. Once we arrive home we had to tackle one of the most important questions ever…WHATS FOR DINNER?! HAHA! We had endless amounts of our Korean meal from the night before…or we could go grab a bite elsewhere. We decided to go out. CHICKEN! Grilled Chicken! Once home we FINALLY remembered to bust out the surprise for Rebecca’s birthday. A nice cool treat from Korean Baskin Robbins! Goodnight Seoul! Until we meet again tomorrow! We got off to a late start today, but thats okay because we had no real formal plans in place. Typically I’m notoriously known as a planner, I drive Mr. B nuts needing to know or have some sort of back up plan in place. Since Rebecca’s been in town I’ve really surprised myself and we have been taking everything day by day. Today Rebecca was interested in checking out some Buddhist temples near our home. We decided to hike up to the Soyosan Temple. The hike was really nice, we lucked out with another day of gorgeous weather in Korea. We snapped some photos, people watched, and hiked our way up to the Temple. We all laughed and giggled at the air machines that the hikers were using to to spray off their hiking boots with. We also couldn’t get enough of all the little Korean children running around enjoying their summer weekend. What fun we had just people watching. After our short 2 mile hike we went to Lotte Mart and exposed Rebecca to a Korean grocery store. Rebecca described it as sensory overload, you know I’ve got to agree with her on that one. There are just people everywhere, loud speakers blasting with Korean, free samples of various foods, not to mention the endless amounts of foreign grocery goods to explore. A shopping cart full later we purchased our dinner for the night. We decided to have a fun cook in Korean night. Mr. B cooked, Rebecca chopped, and I stirred, prepared the tofu and cleaned up around the kitchen. We sipped on Soju and some wine. Made Kimbap, pickled quail eggs, chopchae/japchae, Bulgogi, fried tofu, and grilled garlic chips. What a feast! We may have went a tad bit overboard…quickly realizing that we cooked entirely way to much food. Plenty of lunch leftovers to go around. Rebecca can now proudly say she knows how to cook chopchae/japchae and roll some kimbap. Memories I know I’ll never forget, I don’t think she will either. We cleaned up dinner and all watched Despicable Me. He-He-He! What a cute movie!! Another great day to add to the books.